Mary will be GOHing with aplomb at Boskone this weekend, Feb 16-18. Will she see you there? Who doesn’t love a good session of Mad Libs, Boskone style? Join us for a special edition of Star Wars Mad Libs — in which the audience provides the nouns, adverbs, and adjectives for a raucous reading performed by our panel of program participants. Calling all dancers! Join our Guest of Honor, Mary Robinette Kowal, as we travel back in time to Britain’s Regency period, when dancing was all the craze. Antonia Pugliese from Commonwealth Vintage Dancers, a Boston-area nonprofit that reconstructs, performs, and teaches dances of the 19th and early 20th century, will lead us through Boskone’s special set of Regency dances. So put on your 19th Century duds or keep your modern wardrobe to represent your favorite era — as we genre-happy gentlefolk join together to dance, Regency-style! Welcome to Boskone, New England’s longest-running convention for science fiction, fantasy, and horror! Whether you are attending for the first time or the fifty-fifth, we invite you to join us in the Galleria to meet this year’s guests. The Boskone Book Club continues! Join us for a conversation that brings con-goers together to consider one noteworthy work at length. This year we are reading Ghost Talkers by Mary Robinette Kowal (our Guest of Honor). Boskone’s own Bob Kuhn will lead the discussion; Mary Robinette Kowal will join the group halfway through for a Q&A. To participate, please read the book and come ready with your thoughts and questions. Professional puppeteer; costumer; voice actor — Mary Robinette Kowal is a multitalented marvel. But she’s here mostly as a Hugo-Award-winning SF/F author with a delightful gift for storytelling. Join us for Boskone’s Guest of Honor hour, conducted by Mary’s good friend (and former astronaut!) Cady Coleman. Fantasies set in the past are growing ever more popular. Why do we love stepping back in time and sprinkling a little magic into the past? Could these same stories be told in modern times, or would some of that magic be lost? And when changing the workings of the known world by adding magic, is it still important to keep historical details correct? Characters don’t wear costumes; they wear clothing. What’s the right raiment for the right person? Think about the style statements made by James Bond, Brienne, Doctor Manhattan, Gandalf, Kip Russell, Josephus Miller, Offred, Diana Prince, Alexia Tarabotti, or Jane Vincent. Our fashionistas discuss some of spec fic’s fashion faux pas, as well as some truly ingenious choices of garments for our favorite fictional characters. What does it take to become an astronaut? What’s it like to live in space? 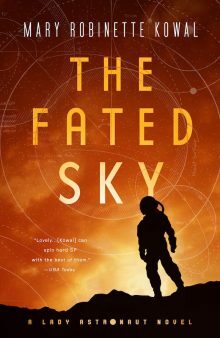 These questions and more are just a few of the queries that will get answered by astronaut Cady Coleman as she sits with science fiction authors Mary Robinette Kowal and Stacey Berg who ask her everything you ever wanted to know about life in space.